Larry Crow of Competitive Edge Gunworks has developed a new action that allows the rear of the receiver to float. The front of the action features a large block that secures the action in the stock. Though similar in appearance, this is NOT a barrel block. The barrel snugs up to a shoulder inside the front block, much like a conventional action. Though the oversized block does the “heavy lifting” in terms of securing the action to the stock, there are two (2) action screws. One threads into the underside of the block while the second is placed further back where it attaches to the underside of the normal-diameter section of the receiver. This provides an extremely secure mount while allowing the rear of the action to float free above the stock. Crow has tested the rifle with a variety of calibers including large magnums. Crow explains: “Our action mounts [with] an extended front lug and allows the rear of the action to float. When fired the barrel harmonics travels back through the action with the back of the action floated. There are no bedding issues which cause vertical stringing. The action is 4340 Rockwell to 42 with 1.228″ X 1.0625″ X 16 T.P.I. barrel shank. The standard action comes with a 20-MOA Picatinny rail. Our bolts are one-piece with M16-style extractor under right lug for 3 O’Clock ejection. Bolts are 4140 Rockwell 42 with R60 hard chrome finish. This [delivers] true bench rest accuracy in a tactical platform.” Shown below is the new action installed in a laminated wood stock and in a McCree modular metal stock (lower photo). For the new action, Crow has also developed a new, super-strong, one-piece bolt. The handle is integral with the bolt. This should be stronger (and more durable) than a conventional bolt handle attached only with silver solder or a spot weld. Shown below are prototype examples of the new one-piece bolt. Production versions will be fluted. Note how the M16-style extractor is integrated into the recoil lug. 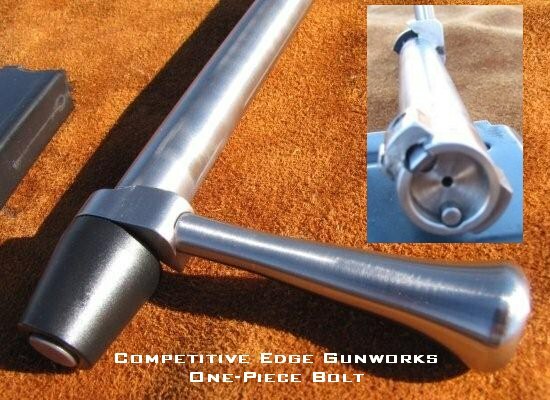 Share the post "New Semi-Floating Action from Competitive Edge Gunworks"
READ THIS!! 4/1/2009 UPDATE: Bruno’s Wolf primers are sold out. Call for current availability of any primers. 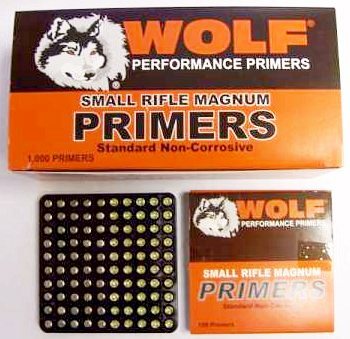 Amy at Bruno Shooters Supply let us know that she just received 250,000 Wolf Small Rifle Magnum primers (i.e. 250 1K boxes). These are the Russian-made primers that work well in the 6BR and 6-6.5×47 cases. Note, the magnum version of the Wolf small rifle primer is much preferrable to the standard Wolf small rifle primer which has a fairly soft cup. Price is $23.50 per 1000-ct box. Share the post "Bruno's Has Wolf Small Rifle Magnum Primers"
Credit German Salazar for this smart tip. 6XC dies tend to be pretty expensive. If you already have a 6BR neck-sizing die, you can use it to neck-size 6XC brass. Redding Reloading sells a set of three washers that raise the die in the press, part number 80901. Each kit includes three spacers: (.062) No-crimp or partial resizing, (.125) 44 Spl/44 Mag spacer, (.135) 38 Spl/357 Mag spacer. If you buy two sets ($7.11 each at Midsouth Shooters Supply) and use both 0.125″ spacers and one 0.135″ spacer then you can neck size 6XC cases with your 6BR neck sie without messing with the lock ring setting. You can also use the same spacers to switch pistol dies (e.g. between .38 Special and .357 Magnum). Hornady also sells inexpensive .135″ spacers to switch from .38 spl to .357. Speaking of the 6XC, Bruno Shooters Supply now has Norma-brand 6XC brass, item XCNB. Price is $0.68 per case, or $68.00 per hundred. 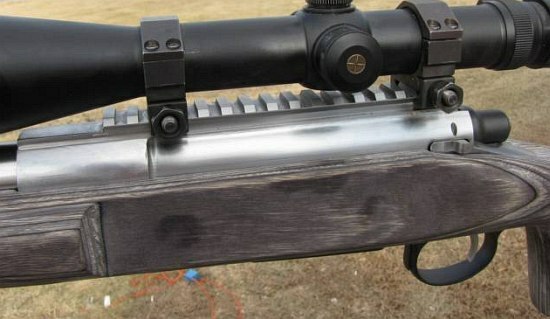 This is very good brass that uses a large rifle primer, whereas the 6-6.5×47 Lapua uses small rifle or small rifle magnum primers. Share the post "Use Spacers to Neck-Size 6XC cases with 6BR Die"
One of the largest gun shows in the country runs next weekend, February 13-15, starting at 3:00 pm on Friday. Held at the Dulles Expo in Chantilly, Virginia, the Nation’s Gun Show will feature over 1000 tables of vendors and displays. The show floor covers the equivalent of two football fields, with over 1.5 miles of guns, knives, and accessories. Admission is $18.00 for a 3-day pass, or $12.00 each day for adults. You can save $1.00 with the coupon below. Or, you can get FREE ADMISSION to the event if you join the NRA at the show, or renew your NRA membership at the show. (Offer valid on $25.00 or greater membership). Share the post "Nation's Gun Show in Virginia Next Weekend"